“I think they saw a woman of color– Latina, no less– that came from a working-class and poor background, that ascended to federal office, and they said, ‘We cannot allow this to have credibility, because if people saw that she did it, then maybe others will come– and we cannot let other people like her run for office. We need to make an example out of her,’” Ocasio-Cortez told me. Meanwhile, she says one thing people aren’t saying about her is that there is an ordinary reality beneath the caricatures. “It’s really hard to communicate that I’m just a normal person doing her best,” she shrugged. “I’m not a superhero. I’m not a villain. I’m just a person that’s trying. One of her best friends in Congress, freshman Ilhan Omar (D-MN) has it even worse. Sudden fame has swept her up out of relative obscurity too. Each has two Twitter handles. @AOC has 3.53 million followers, the most of anyone in the House. @SpeakerPelosi comes in second with 2.35 million. (Kevin McCarthy’s @GOPLeader handle has 247,000 followers and his personal @KevinOMcCarthy has 48,400 followers.) Ocasio’s secondary “official” twitter account, @RepAOC, has another 145,000 followers. Ilhan Omar’s main handle, @IlhanMN has 740,000 followers and her secondary one, @Ilhan, has 112,000. Both young women are very much in the public eye– and under a constant barrage of attack. Ilhan stepped on AIPAC’s sensitive toes and they won’t rest until they drive her out of Congress. 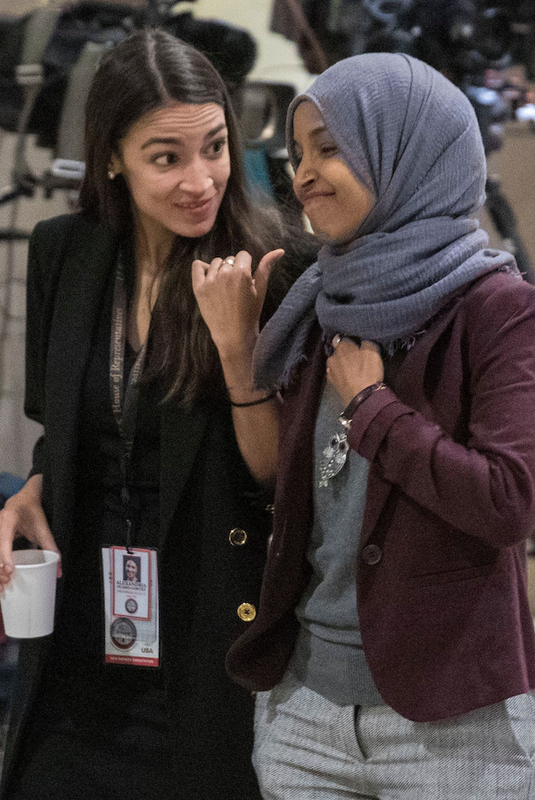 Her comments about them– 100% true (and remember, 100% is more than 99.7%– were a little too close for comfort for them and they began screeching “antisemitism,” even though nothing she has said is even remotely related to antisemitism. It doesn’t matter. She’s getting the Cynthia McKinney/Earl Hilliard treatment— political annihilation. The Blue America “best incumbents” thermometer on the right will allow you to chip in to her reelection campaign. Her political enemies are trying to recruit a candidate against her. Omar met with Hunegs last month, after her initial remarks received widespread condemnation. She has continued to meet with Jewish leaders both in Minneapolis and Washington, a spokesman said. Some Democrats are eyeing Bobby Joe Champion, a state senator who has served in the legislature for a decade. Others hope to entice Minneapolis City Councilwoman Andrea Jenkins, the first openly transgender African-American woman elected to public office in the United States. “I’d be pretty uncomfortable supporting Rep. Omar right now, given what I’ve learned about her since the election and given her apparent inability to stop insulting Jews,” said Latz, who represents the city of St. Louis Park, home to a large Jewish population, and who supported Omar’s chief rival in the 2018 Democratic primary. But finding a challenger to take on Omar is a difficult prospect. No House Democrat from Minnesota has ever lost a bid for renomination, according to University of Minnesota political scientist Eric Ostermeier, author of the Smart Politics blog. Only two House members from Minnesota have ever lost primaries, most recently more than a century ago. Jenkins told The Hill on Wednesday she is not interested in running for Congress, and she backs Omar for reelection. Champion did not respond to several requests for comment. A part of the challenge in fielding a competitor, Minnesota Democrats said, is that Omar is likely to win the endorsement of the state DFL, which comes with access to voter lists and data that unendorsed candidates do not receive. Omar, 37, won the Democratic-Farmer-Labor Party’s endorsement in 2018 over two other candidates. She won the DFL primary with 48 percent of the vote, well ahead of former state House Speaker Margaret Anderson Kelliher– who did not seek the endorsement– and state Sen. Patricia Torres Ray. Omar’s win underscored a deep geographic and racial divide in one of the most liberal congressional districts in the country. The district includes the entire city of Minneapolis and its whiter, wealthier western suburbs; about 67 percent of its residents are white, compared with about 84 percent of the state as a whole. Omar, a Somali-American and one of the first two Muslim women to serve in Congress, won big in Minneapolis itself. Kelliher, who is white, won the suburbs west of Minneapolis by wide margins. Omar’s base inside the city is another challenge any rival would have to overcome. “The core of Minneapolis outvotes the suburbs, even though the population may be relatively similar,” Erlandson said. Several potential candidates have already taken themselves out of the running. Latz said he considered a bid “for all of a half a second” before opting against it. Kelliher, appointed in December to take over the state Department of Transportation, is “entirely focused” on her new job, a department spokesman said. Samantha B’s segment is the best look at this “controversy” you’ll find. I wish Pelosi had said it. But she can’t– big Jewish donors won’t allow it. 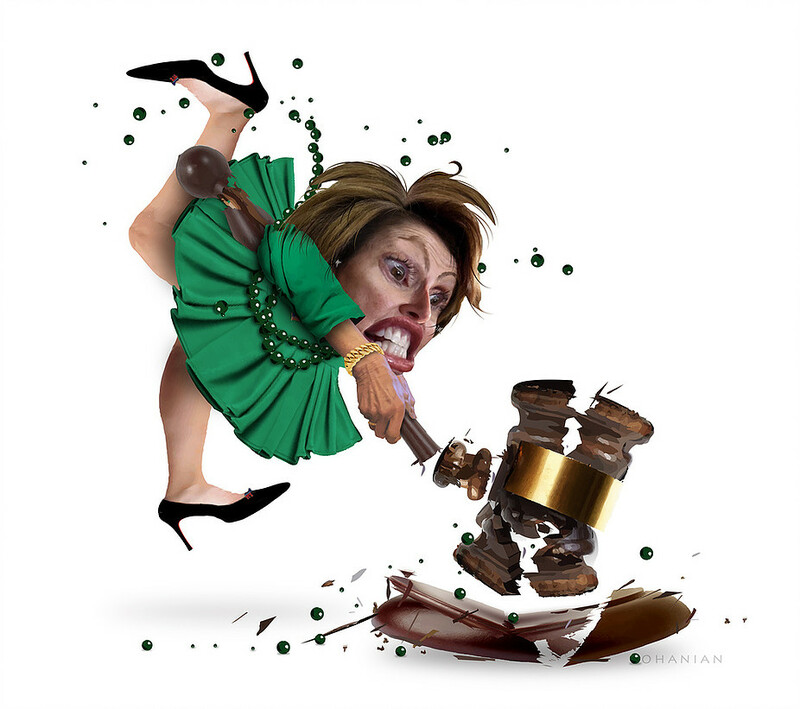 Oh, and speaking of Pelosi… there’s another way of looking at her latest “impeachment is off the table” statement. Maybe impeachment isn’t really off the table. Maybe Pelosi is planning to gut him like a fish and serve him up as some nice piping hot San Francisco cioppino. 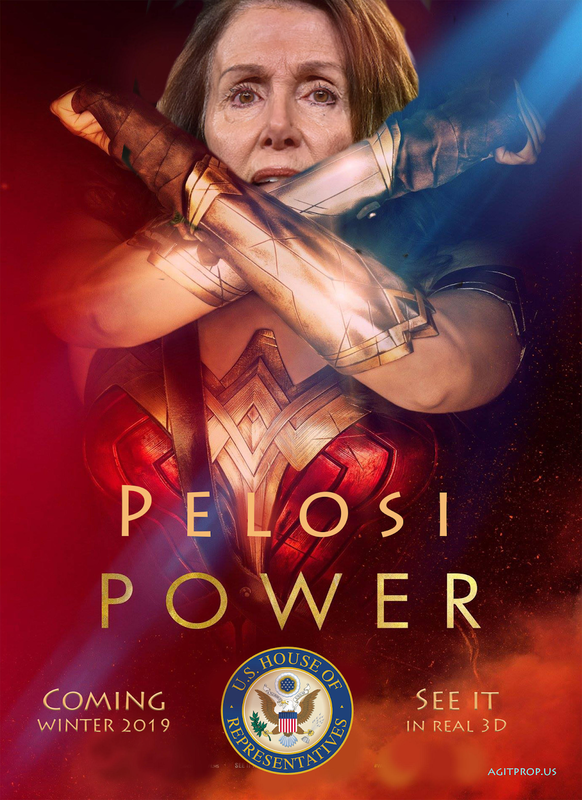 …Soon, it will fall to Pelosi to try to bring Mueller’s findings to light. “If you’re ever going to get to impeachment, you need to get all that data,” says Representative Mark Pocan of Wisconsin. Pocan once gave Pelosi a pair of oven mitts emblazoned with one of her favorite phrases: too hot to handle. It’s shorthand for her strategy of leveraging public opinion to pressure Republicans to do things they oppose, like ending family separations at the border or reopening the government. The idea is that no matter where your opponents start out, or how committed to the President they profess to be, when the politics changes, they’ll change with it.